Click the button below to add the SPIDER GIRL! Gymnastics Leotard Red & Blue: FREE SHIPPING and Free Scrunchie!!! to your wish list. IMPORTANT: This item is handmade to order in California. In Stock. Ships Next Business Day! Please allow 8-10 Business Days for item to be shipped. Please CLICK HERE FOR SIZE CHART prior to ordering to confirm size needed. This will help avoid the need for exchanges and save you money on return shipping! NOTE: Size AL and AXL sizes are not returnable/exchangeable. I ordered this suit for my daughter who is a huge Spiderman fan. It arrived quickly, and is amazing quality. Since giving it to my daughter, who trains 9 hours a week currently (she's only 6) I have literally had to peel it off her to wash between training days. She has completely disregarded any of her old bodysuits and only wants to wear the Spiderman one. Thank you Leotards4less for such an amazing product! I will definitely be ordering more bodysuits in the future. My daughter loves her spider girl Leo!!! She couldn't wait to wear it to practice. Fits perfect, looks great, we are very happy with the product! Great Leo! Fit perfect and super comfortable too. This is the fourth super hero leotard I have purchased for girls on my daughters team. They are all made very well and the girls love wearing them. Very fun leotard and well made. 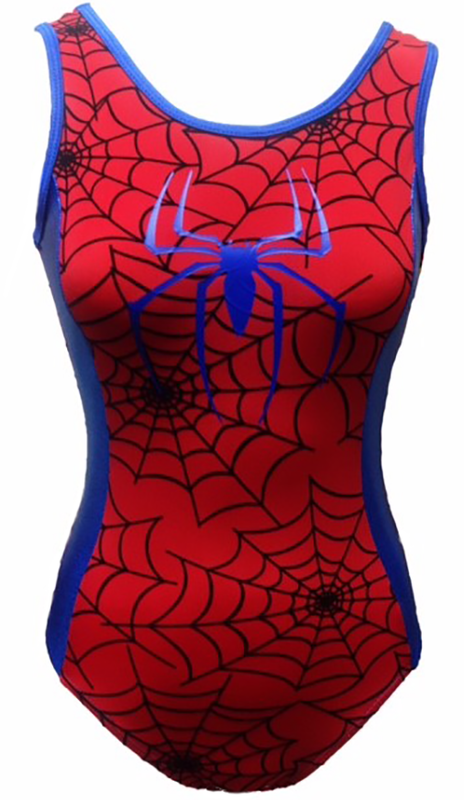 Awesome Leotard for Spider-Man Fans! This leotard is so cute and fits great. The quality is great for the price. My daughter is in an aerial silks Super Hero performance and this leo is perfect for it!